This may be old hat to some, but it's a very worthwhile concept and I was interested in the background of their no glliter on cards requirement. To support our nation’s armed forces by sending blank greeting cards to write home on, as well as cards of gratitude to encourage them. To support this cause, Operation Write Home offers card makers a lot of support and have developed a blog community. 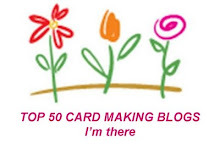 Check out the site and blog for card challenges and some great tips for card making. There are even some free digital stamps donated by well known digital artists to help you with making cards for the armed forces. And the most often asked question - Why no glitter? The reason behind our "no glitter" requirement may help to clarify things. It's not about the shiny aspect of glitter. It's about the messy side of it! Many of our deployed heroes live in very primitive conditions. Primitive as in no showers for a couple weeks. No laundry. Nowhere to get cleaned up. And if they open a box of cards and get sprinkled all over, they might have absolutely nowhere to get rid of all that mess; they may not even realise it's all over them. And if they have glitter on their uniforms it can put them at risk — it can make them visible to night vision goggles, and that is just not a risk we're willing to take! More on the topic at the site.